Bringing clean drinking water to the impoverished villages of Karabakh. For centuries past, water has been considered the very source of life. Nomadic communities traveled in search of it, great civilizations blossomed on its banks and it has altered the geopolitical map of the very globe itself. 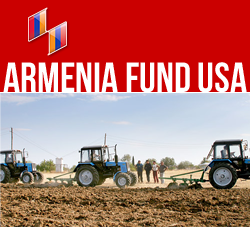 Armenia Fund USA is proudly focusing its newest 2004 humanitarian efforts on the development of effective, sustainable water supply systems in the capital of Stepanakert, in the Askeran region and Maghavuz in the Mardakert region. ▪ Phase I – $176,000 is needed to stabilize the region’s water distribution infrastructure by constructing two reservoirs, pipelines to transport the water from the rivers to the reservoirs and a cholrenic purifier system. ▪ Phase II – $114,000 is needed to build two pressurized pipelines to distribute water from the reservoirs to the region and create a pumping station. The Maghavuz Waterway initiative, with a more local focus, impacts a small rural village of 650 residents. The project’s funding goal of $92,000 will in turn concentrate on renovating the existing pump station, water pipelines and two reservoirs, and constructing a distribution network and two pumps. Armenia Fund USA is requesting your immediate financial support to extend this vital lifeline so urgently needed by the people of Karabakh. Together, we can realize our unified goal of steering Karabakh on a path towards prosperity and progress. Armenia Fund USA’s mission is to make a difference locally in the everyday lives of the men and women of Armenia and Karabakh at the most fundamental levels and fundamental to the lives, health, dignity and future of our fellow Armenians is clean, safe, secure and accessible water.